After a run to new highs for the major averages, each pulled back to support this past week as a rout in the technology and internet sector weighed on the market for most of the Labor Day-abbreviated week. By Friday, the technology sector fell by -2.9%. Among the major decliners, Microsoft Corp. MSFT, logged a weekly drop of -3.7%, while Google-parent Alphabet Inc. represented by GOOGL and GOOG skidded -4.4%. Facebook Inc. FB was among the biggest losers, tumbling -7.2%. The S&P 500 closed down -1% on the week, the biggest weekly decline in two months, but it still remains roughly within -1% from the record set on Aug. 31st. The benchmark maintained its breakout point of 2,873 which I noted last week as new support. The Russell 2000 lost -1.5% and remained above coinciding support offered by the previous summer highs of 1,700, and its 50-day moving average, currently at 1,693. 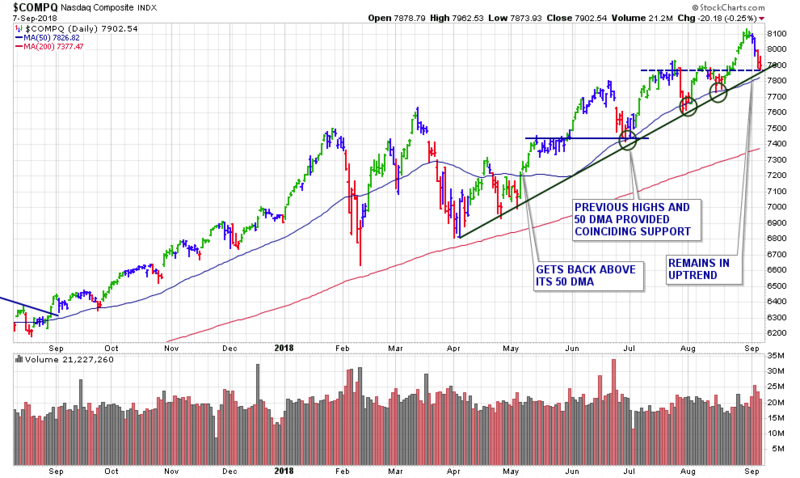 The Dow Jones, which was the only index of the four not to set a new record high recently, and is less affected by tech names, lost the least as it edged down just -0.2% to first support (25,888) early Friday, before closing the session higher. We had another buyable breakout on Friday as shares of QTWO traded above their TRIGGER PRICE on nearly twice the normal volume. This morning, things are looking up as U.S. stock futures are significantly higher with the Dow’s up 88 points. I ran my routine stock screens over the weekend and added 1 new stock to our watch list. 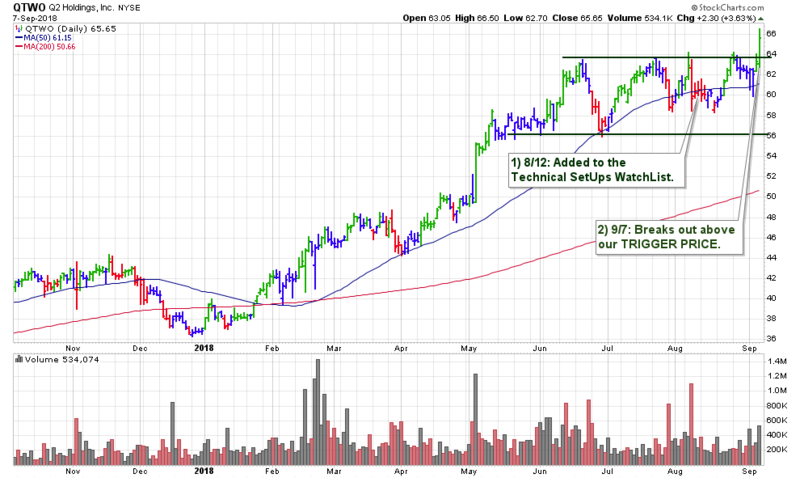 We now have a lucky 13 stocks which we will be watching for the next buyable breakout – see here.